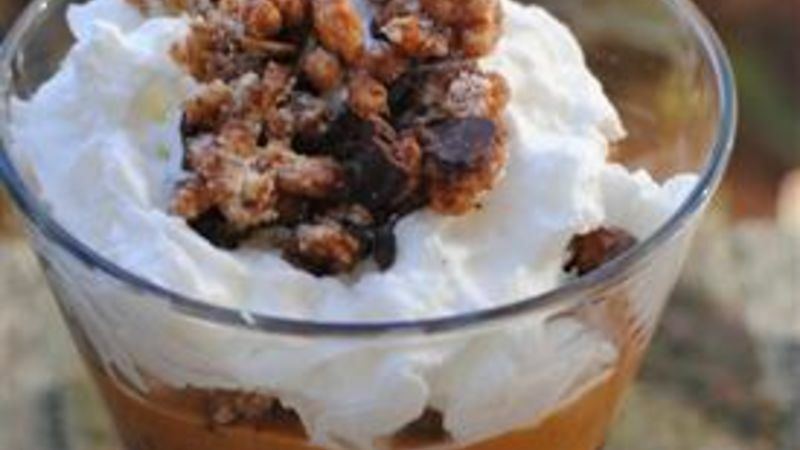 Layer chocolate, peanut butter, and crumbled Fiber One™ in a parfait glass and top with whipped cream. Garnish with crumbled Fiber One™ and serve! Fiber One™ Bars have revolutionized breakfast for me. This super quick and easy morning meal tastes like a candy bar but is actually good for you. They can also be a great pre-workout snack, or a simply lovely 3 p.m. treat perfect for warding off the evil afternoon slump at your desk. In fact, they’re such a delicious treat that I made them into a dessert. And not just any dessert, but a pretty, chocolatey, party-worthy dessert! To make these delicious Fiber One™ Chocolate and Peanut Butter Parfaits, you’ll need: chocolate (pudding, mousse or even Nutella will work), peanut butter, whipped cream and of course, Fiber One™ Bars! There are many Fiber One Bar flavors, but my favorite is Chocolate Caramel & Pretzel. At only 90 calories, this sweet tasting bar is awesome, but feel free to check out all the flavors on your own to pick your favorite! Be sure to be careful about your layering—you want the parfait layers to look pretty, not sloppy. For a garnish, you guessed it—use Fiber One! This easy to assemble, no bake dessert is perfect for entertaining. It takes about 5 minutes to put together, so anyone can do this. The parfaits would be great as dessert “shots” as well, using small dessert glasses and a mini spoon for the added cuteness factor.